The Olympic Team: Sam Mikulak, Chris Brooks, Jake Dalton, Alex Naddour (aka Mr. Hollie Vise), John Orozco. Brooks hugging OTC athlete liaison, Sherry. An update on Simone’s floor music lyrics. John Orozco did not participate in media day, which is before the meet, or after day one in St. Louis or Hartford (other than post-meet NBC interviews); something every single other one of his fellow National Team members did. This was not a single disgruntled reporter crying foul, and if Orozco can\’t handle the pressure of meeting the press, that doesn\’t bode well for how he\’ll handle the Olympic crush where, yes, talking to the media will be required. I guess I feel like that should be the major reason why it’s a bad/notable thing. 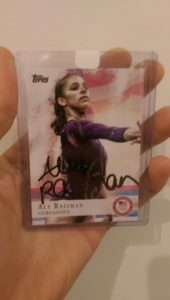 Also, there is actually a contract that every National Team member signs. John receives monthly funding from USA Gymnastics, and accepts sponsorships, and inherent in doing both is his obligation to promote his sponsors and USA Gymnastics by speaking to the media. His case about \”just not wanting to talk about\” his mother\’s tragic passing, which occurred in March 2015, is also weakened a lot, as far as I\’m concerned, by the fact that he retweeted an extremely personal, in-depth family profile from People magazine, immediately before all the fan comments saying he shouldn’t talk to media if he doesn’t want to. The reality is that no one is “making\” John talk about his mother, or his injury(ies). It has been his choice to be so public about this tragedy, and he’s done so many, many times, by his own choice. Secondly, both official selection procedures, which are a legal, binding document approved by the USOC, and prevailing USOC policy, stress team medals above all, so conceding team and forming a group of individuals with the highest possible finalist potential was never an option. Regardless, as it stands, every member of Team USA has been a World and/or Olympic individual finalist in the past, and two are individual World medalists; Hardly a weak group in respect to finalist potential. The U.S. men will have to work hard to get a medal in Rio, but it’s specious to suggest it\’s beyond the realm of possibility. It’s not as if they\’re ranked 12th. Realistically, on any given day, they’re in three-way battle for third with Great Britain and Russia. Oh and, for what it’s worth, Williams has won seven NCAA team champs for Oklahoma since 2000, not six. He was also the head coach of the last U.S. team to win a World team medal in 2014. Other than that, carry on. So let me get this straight. You think that John not wanting to talk about his dead mom and falls at the Olympics before competing in the biggest meet of his life (his words) isn\’t true because he retweeted other articles the media wrote about where that\’s all he talked about\’?!??????? Actually I’m saying that every single one of his teammates talked to the media before the biggest meets of their lives. Why should John Orozco alone be exempt from that? And what does it say about his mental toughness if he has to be in order to handle that big meet pressure? The other guys didn’t get the option to skip the media, and there is plenty of tragedy and hardship in their stories as well. For instance, Chris Brooks father passed away suddenly when Brooks was quite young, too. Heck, Brooks has stated publicly that what he was saying in Orozco’s ear after the team was announced was that they were “both looking down on us”: meaning his dad, and John’s mom. That’s some pretty powerful emotional baggage, and yet Brooks seemed to handle meeting with the media just fine, all along the process. John could easily have told the media, ‘I’d prefer to just focus on my gymnastics today,’ or refuse all along to discuss his mother’s death because it was too difficult. That would be understandable to most people, including the gymnastics media. This isn’t Meet the Press or the Benghazi hearings; It’s a pretty softball set-up, as far as press goes. And, yeah, when you put your tragic backstory front and center, you shouldn’t be surprised when people want to ask you questions about it. John’s genuinely emotional “story” is a big part of his appeal to sponsors and fans. I don’t really think you get to have it both ways, where you lean on that appeal to get the sponsorships and attention you crave, but only when it’s convenient for you. Orozco doesn’t owe the media his tears, but he is a paid, professional athlete and talking to the press is part of being a sports professional. The issue with John and the media though is that they have decided that he is the headcase. At 2014 nationals when he was getting ready to go on pommels, they put up on the big screen him falling on pommels in London and played it TWICE when he was standing there waiting to go. When watching the Trials, they mentioned Leyva doing well at those trials, but they talked about John like he was some crazy headcase who fell at the time because he fell at the Olympics. They’ve always treated him like that when in actuality he was injured in London AND Leyva and Sam also fell! But somehow he’s the only one who gets treated like that. He does have a responsibility to talk to media and he did talk to NBC Olympics and People Magazine so it seems like a compromise was struck. He talked to a couple big names, got it over with where yes the story was about his dead mom and then didn’t have to deal with it anymore. Of course as an athlete you have to talk to the media, but when you’re competing in Olympic Trials and don’t wanna talk about your dead mom, I can understand why and it was great that USAG let him go in a good mindspace instead of having to talk to Nancy Armour. I have lost a parent and I know how horrible it is for the first year or so after they’re gone so yeah. Either way it worked out! Nancy can be made she didn’t get to write a piece on John, but it was very rude to go out of her way to call him out. Particularly when he did respond and she never said anything publicly anyway. You have every right to your opinion, but your facts are simply incorrect. John didn’t refuse to talk to Nancy Armour or USA Today.. He refused to talk to the media, period. There are open media events prior to the meet (media day), and after each competition (mixed zone). These are for ALL media outlets. All accredited media has access to the athletes at the same time. This is what John skipped, and what every other gymnast in the competition was required to attend these by USA Gymnastics. John skipped these same events in Hartford, earlier in the month. The People article was done well before St. Louis. He didn’t “talk” to them there either.. Orozco was made to talk to NBC after the meet, because NBC is a huge source of USA Gymnastics financials and what NBC wants, NBC gets. Question about funding if they make the National Team….Does accepting the money affect their NCAA eligibility? No. National Team stipends are really just reimbursements for training/travel expenses. The money cannot be used for anything else. Its paid by the gymnastics federation, not a sponsorship of endorsement. It doesn\’t affect NCAA eligibility. I love love love this podcast! Have been listening non-stop since I stumbled on it a few weeks ago. Also, watched the Trinity Thomas split jump moment about 30 times in a row after this lol. As a sports scientist I need to question Aly\’s running comment though. This girl is working out 8 hours a day. WHY is she running an extra 30 minutes every morning?!!! Her work ethic is incredible, there is no doubt about that. And cardio has its time and place, but not here as we\’re prepping for the Olympics. There are ways for coaches to weave various training in and out throughout the season for the girls. I FULLY agree with Sacramone from ep. 200 when she said getting in a weight room and doing hot yoga and just other training methods in general helped her become a better athlete rather than just a skilled gymnast. That is awesome and needs to be implemented into the sport, but not on top of their training hours as we\’re closing in on the Olympics. It\’s probably a huge reason why Aly is so tired all the time and infamous for napping. Her body is doing SO much nonstop. She needs to recover (and yes, there are ways to do this while still going to 8 hour practices 6 days a week). I could go on about overtraining and nutrition but I\’ll stop there! I don\’t know Aly, or Mihai, or their program, but from the outside looking in, thats my professional opinion. Thank you for pointing out the hypocrisy of NBC commentators NOT calling Sam a head case after falling 3 times at Trials, plus messing up majorly elsewhere, but treating other gymnasts that bobbled slightly or fell once as such (i.e. Gabby & John). I get that Sam’s a better gymnast than the other men on the US team difficulty wise, but he can’t compete 6 for 6 to save his life, and pretending like it’s no big deal really annoyed the crap out of me. His inconsistency is a big deal, and the men’s team should be worried. I have more faith that John will hit pommels in team finals than Sam hitting all 6 of his routines. Great episode but with all the notoriety Gymcastic is getting do want you to continue making fun of an immigrant\’s heavy accent? Whether you like him or not Bella and Marta made the decision to move to a new country and learn the language. Yes they both speak with heavy accents but not everyone has a the ability to pick up phrasing and cadence easily.. Can anyone of guarantee that you\’d do a better job if you moved to Romania and had to learn the language? That section was funny but ito made me a little Trump uncomfortable if you know what I mean. Yeah, I basically worship the ground you guys walk on. I laugh hysterically at podcasts and *love* the insights and wisdom. Now that your notoriety is exploding, I know you guys will manage the growth while being true to your art/expertise. So happy for you all!! !